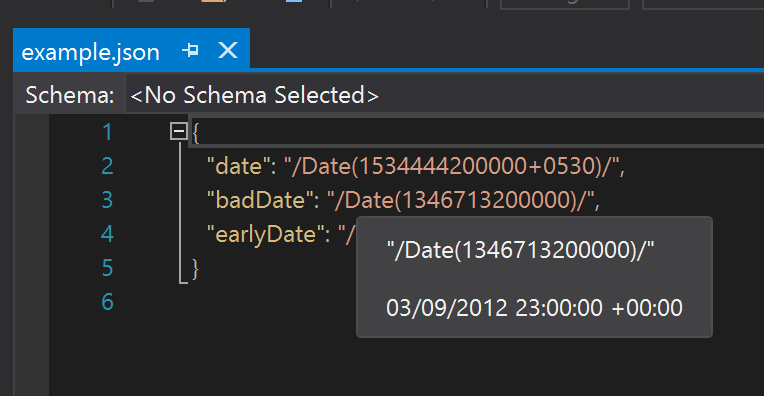 It’s been a long time since I extended Visual Studio, and I have to say, the experience has gotten a whole lot better. I’ve been doing a lot of work with JSON dates (more information about this at the end, but stick with me for the journey first). The problem is that they are not very human readable. Who knows when this date is for? So initially I came up with the idea of a tool window where I could convert them over, but a quick hunt on MSDN led me to https://docs.microsoft.com/en-gb/visualstudio/extensibility/walkthrough-displaying-quickinfo-tooltips. It looks like this would be even better. You can see the code at https://github.com/alski/JsonQuickInfo. All of the action takes place in lines 31-91 of JsonQuickInfo.cs, and yes I will refactor that very soon! !